I’VE ALWAYS been a sucker for scientific imaging competitions, which is just as well as this seems to be one of the main growth areas in science today. Every month seems to bring along a new competition for scientists to enter, or a call for entries to an established competition. The most interesting time, for me, is the announcement of the winners. Now at last I can consider the artistic and scientific effort that has gone into making these images, some of which take huge amounts of work and some of which present otherworldly vistas that fairly boggle the brain. 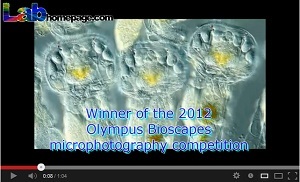 Recently the rise of digital video has changed the nature of some of these competitions, including the annual Olympus BioScapes contest which announced its results this week. This time, the winning image was a video rather than a still image. And an excellent video it is too. Filmed by a teacher from Australia, Ralph Grimm, it shows rotifers collected from his own garden pond as they engage in feeding activity. I’m not entirely sure why, but this minute-long movie manages to combine undoubted scientific merit with a certain charm. I’m clearly not the only one to think so, for the video posted on our own YouTube channel just a couple of days ago has already attracted nearly 1200 views. I know from experience that non-mainstream subjects can be very well portrayed by video, but that even those that have a great deal of effort put into their creation can sometimes attract views measured by the dozen rather than the thousand. Our congratulations, then, to Mr Grimm and to Olympus for making scientific imaging both accessible and engaging . Finally, our best wishes to all LabHomepage readers (and video viewers) for the festive season. We’ll see you in the New Year.